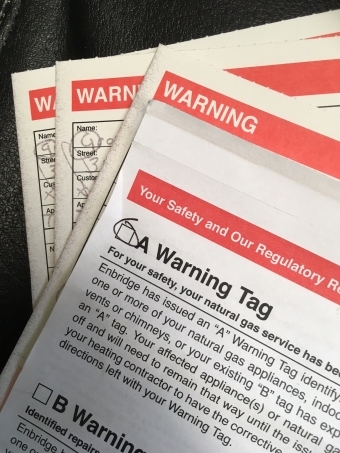 What Do I do about a Gas Warning Tag? Warning Tag issued. Now What? Gas warning tags or 'Red Tags' are not to be taken lightly. An "A" tag is only issued when there is imminent danger and requires immediate remediation. Should the issue be less of a concern but still against safety codes, a "B" Tag is issued. Any Technician with a TSSA Gas License, is required to tag an appliance regardless of the purpose of the visit. For example, if a Technician comes to fix the water heater, he/she may see reason to tag the Furnace. Likewise a mandatory Gas Meter Exchange can also result in an inspection of your equipment including BBQ gas line, furnace, pool heater, water heater, fireplace etc. Don't be too mad if you receive a warning tag. Although the system may be working fine and has been for many years, there is still risk. It is indeed an inconvenience and can be costly to arrange remediation. However, an obstruction, or gas leak of any kind, could be lethal. Trusted in Niagara since 1981. Beamsville, Grimsby, Smithville, Stoney Creek, Vineland, Jordan, Welland, Wainfleet, Fonthill, Pelham, Thorold, St. Catharines and Niagara Falls.